As December 25th rapidly approaches it’s time to enjoy our favorite holiday traditions. For me, it wouldn’t be Christmas without decorating the tree while listening to Holiday Sing Along With Mitch featuring Mitch Miller and the Gang. As a child it was the vinyl album playing on the console record player (O.K. a lot of you will have to Google that one), now it’s playing on my iPod. To assist in starting new family traditions here are some recently published additions to the library collection for Christmas 2011. Justin Bieber’s holiday album Under the Mistletoe debuted at #1 on the Billboard top 200. It is only the eighth chart topping Christmas album in the 55-year history of the album charts. I have to point out that Mitch Miller holds two of these eight spots. Other new holiday music CDs are The Classic Christmas Album by Tony Bennett, Chicago XXXIII : O Christmas Three, Seasons Greetings : a Jersey Boys Christmas, Christmas in Diverse City by Tobymac, Glee : the Music ; the Christmas Album 2, Irish Country Christmas by Craig Duncan, and A Very She & Him Christmas with duo Zooey Daschanel and M. Ward. Stressful family dynamics during the holidays is a recurring theme in fiction this year.The Christmas Wedding by James Patterson; a mother’s remarriage after the death of her husband, 1225 Christmas Tree Lane by Debbie Macomber; children hoping mom and dad will reunite, An Angel For Christmas by Heather Graham; sibling rivalry, Lost December by Richard Paul Evans; father/son expectations, Snow Angel by Glenn Beck; overcoming an abusive childhood. For something more lighthearted try a romance. It Happened one Christmas by Kaitlin O’Riley, Bring Me Home For Christmas by Robyn Carr, Season For Temptation by Theresa Romain, or Mistletoe and the Lost Stiletto by Liz Fielding. Add a little mystery to your holiday with Twelve Drummers Drumming by C.C. Benison, A Killer’s Christmas in Wales : a Penny Brannigan Mystery by Elizabeth J. Duncan, A Christmas Homecoming by Anne Perry orMrs. Jeffries and the Mistletoe Mix Up by Emily Brightwell. To brighten your holiday spirit in non-fiction there is The Puppy That Came For Christmas : How A Dog Brought One Family The Gift Of Joy by Megan Rix and The Book of (Holiday) Awesome : When The Christmas Lights All Work, Successfully Regifting A Present, Drinking With Grandma by Neil Pasricha. The library has the help you need with Christmas cooking. New this year is Debbie Macomber’s Christmas Cookbook, Very Merry Cookies from Better Homes and Gardens, Vegan Holiday Kitchen by Nova Atlas, Christmas With Southern Living, and Bake Me I’m Yours – Christmas. We can also help with holiday crafting for decorations and gifts. You will get many ideas from Have Yourself A Very Vintage Christmas : Crafts, Decorating Tips, and Recipes, 1920s-1960s by Susan Waggoner, Holiday With Matthew Mead, and Martha Stewart’s Handmade Holiday Crafts. 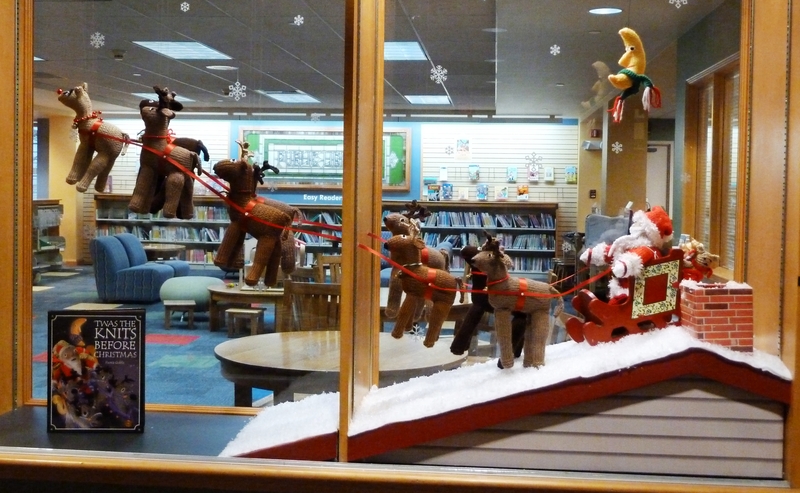 Be sure to stop by the children’s room to see the hand knit display of Santa, his reindeer and more made from the patterns found in ‘Twas the Knits Before Christmas by Fiona Goble. This entry was posted in Book Lists and tagged Christmas by Kim. Bookmark the permalink. I love the knitted scene! I think that should be a new tradition. You must like Mitch Miller! Maybe Mitch was our only Christmas album as a kid? I love the knitted scene in the shop window! !